How about the annoying buzzing sound EL wire/panels make ? I can hear an EL backlight from metres away…. That’s dependent on the frequency of the AC used to drive the EL. Change the frequency, change the sound. I know, i’ve used EL products before. The problem with EL is that it’s frequency dependant, it likes between 100 and 160 Hz, and the color actually changes a bit with frequency. Going over and under that frequency range results in no light or little light, so that’s not an option. It really varies from transformer to transformer. Some of the cheaper ones have loose windings that “sing”. next hack would be just to wind your own transformer. Abite not very efficient, couldnt you make a servo controlled hand made variac? Perfect timing for halloween. Glowing orange/red spiderwebs? Another great write-up. 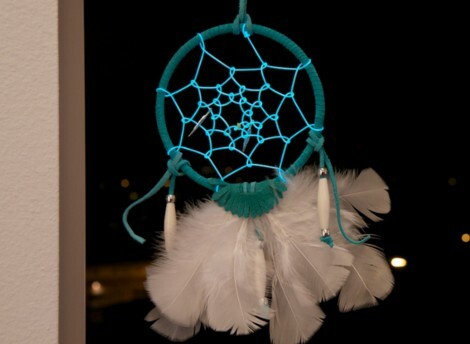 And beautiful dreamcatcher!